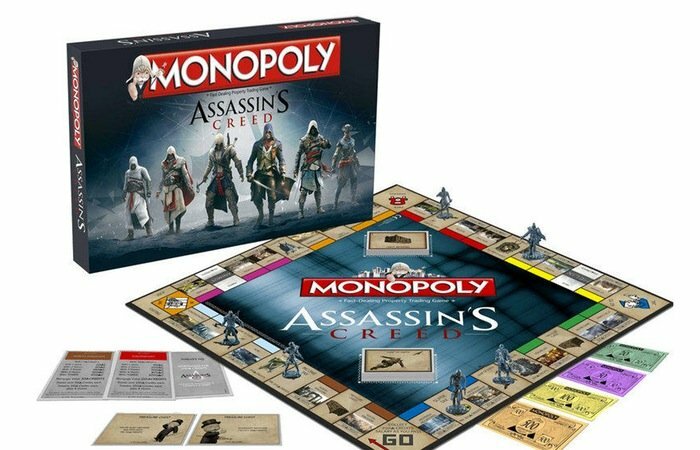 Following on from the themed The Legend of Zelda Monopoly set unveiled earlier this month, now a new Assassins Creed Monopoly set has been unveiled and will be made available in Europe. The new Assassins Creed Monopoly will be launching later this year in time for the holiday season and brings with it six assassins to choose from to play with in the form of : Altaïr Ibn-La’Ahad, Ezio Auditore da Firenze, Ratonhnhaké:ton, Aveline de Grandpré, Edward Kenway and Arno Dorian. Unfortunately no information on pricing or worldwide availability has been released as yet for the Assassins Creed Monopoly set, but as soon as information comes to light we will keep you updated as always. Also as a reminder the latest in the Assassin’s Creed video game series will be launching on October 28th 2014 in the form of the highly anticipated Assassin’s Creed Unity, which will be available to play on the Xbox One, PlayStation 4, and PC. Assassin’s Creed Rogue launches on November 11th 2014 for older generation Xbox 360 and PlayStation 3 consoles.